Our team specializes in the art of public engagement and communication to distill the complexities of resilience, sea level rise, and the changing environment in clear and effective terms. We create customized outreach strategies designed to achieve specific outcomes by developing and tailoring communication tools to the scientific topics pertinent to the target audience. This enables us to have candid discussions with stakeholders, where we can learn about and draw upon the unique positions, experiences and perspectives of the community members. We’ve created tools to highlight changing weather patterns such as extreme heat, rainfall, and drought, as well as the primary mechanisms behind rising seas. By simplifying these complex processes, we are able to inform and educate the public in ways that resonate and help them to visualize the future of their communities, ultimately driving positive change. We work to unify the cities and communities, to provide policy makers with the tools needed to make the most informed decisions, and to help private citizens overcome the challenges they will face on their journeys to a better, more resilient tomorrow. Our Sea Level Rise Ready™ Program was designed to be an existing structure for the customizable education and outreach program of Brizaga. We provide specific trainings for businesses, individuals, communities, and local governments to help them understand the risks of rising seas, how to communicate those risks, and how to reduce those risks. Under our Sea Level Rise Ready™ Program, Brizaga offers a Sea Level Rise Ready Communicator Training, as well as a range of trainings and workshops for businesses and communities. For more information on the Sea Level Rise Ready Program, please visit the program website at https://ready.brizaga.com. Our staff has extensive experience with science communication and public engagement, and is available for speaking engagements, as well. 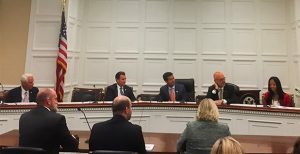 Our co-founder, Alec Bogdanoff, has addressed members of the bipartisan House Climate Solutions Caucus and the Florida State Senate Appropriations Subcommittee on the Environment and Natural Resources.